Bay Village fire crews pulled a kayaker from Lake Erie early Tuesday. Crews responded after receiving a report of a kayaker in the water around 3:45 a.m. According to officials, a man in his 20's was pulled from the water just after 4 a.m. He was spotted about 100 yards offshore near Lake Avenue and Douglas Drive. The kayaker was transported to Fairview Hospital for evaluation. Bay Village officials said the water was very cold and the waves were at 2 feet or less. There was poor visibility in the area due to fog. Bay Village Fire Chief Christopher Lyons told NewsChannel 5 two Bay firemen ended up pulling the man from the choppy water. He was not wearing a life jacket. "Dark, cold. That's a challenging situation to be in for any length of time," Lyons said. He said authorities still don't know what the man was doing in the water during the wee hours of the morning, or how long he'd been in the kayak, but he was suffering from the cold when they rescued him. "He was a little disoriented, a little hypothermic," Lyons said. Authorities tried to figure out why the kayaker was on the water so early in the morning. 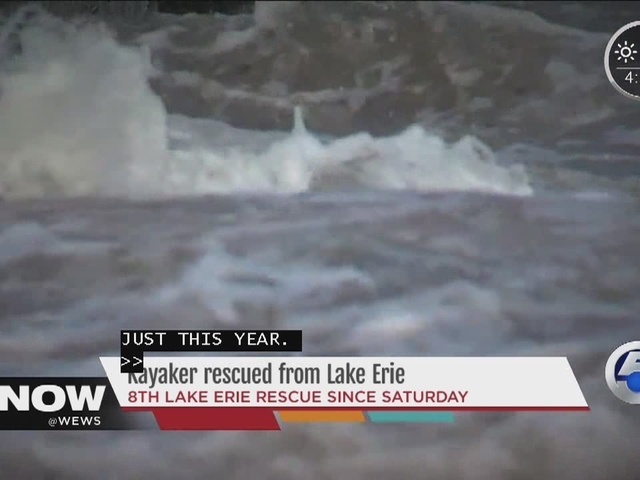 According to the Great Lakes Surf Rescue Project, eight people have been rescued in the lake since Saturday. The Ottawa County Sheriff's Office Marine Patrol and the U.S. Coast Guard assisted with that rescue. The Great Lakes Water Safety Consortium is hosting a Great Lakes Water Safety Conference Tuesday from 8 a.m. to 4:30 p.m. at the Lake Erie Nature & Science Center, located at 28728 Wolf Rd. in Bay Village.